A new model looking at future melt of the Greenland Ice Sheet generated some buzz in the media. Put together by Dr. Alexander Robinson, a postdoctoral researcher at the Universidad Complutense de Madrid, and his colleagues at the Potsdam Institute for Climate Impact Research (PIK), the model predicts that only a very small average temperature increase – 1.6°C above average temperatures during pre-industrial times – is needed before melt of the Greenland Ice Sheet becomes irreversible. Their model, which is detailed in a study published in Nature Climate Change, finds a much lower threshold than the previous estimate of 3.1°C – an estimate arrived at in a model used in the IPCC’s 4th Assessment Report released in 2007. The estimated melting threshold Dr. Robinson and his colleagues put forth is also below the 2°C of average warming the Assessment Report suggests global temperature rise be limited to. With only a 2°C rise in temperatures, the model shows that the Greenland Ice Sheet could experience significant melting over time. This melting would contribute to sea level rise, which would in turn have an impact on low-lying coastal areas and islands around the planet. In this first part of a two-part interview, Dr. Robinson describes how his group’s model works, how it differs from previous models used to predict changes in the ice sheet, and potential future equilibrium states for Greenland. What were your goals when you set out to put this new model together? We wanted to investigate the sensitivity of the Greenland Ice Sheet to climate change in general. The idea was to understand future equilibrium states of the ice sheet (in which it would not be losing more mass than it is gaining) given a certain climatic forcing – like a rise in average temperatures, for instance. What kind of approach did you use? We used an intermediate complexity approach - an approach that only includes as much physics and calculations as we think are necessary to represent the system we’re modelling. This makes the model computationally faster, which allows us to perform a lot of simulations over long time scales and to assess uncertainty better. A volume of ice the size of the Greenland Ice Sheet takes a long time to react to certain forcings, so we have to run model simulations to cover long periods of time into the future to know what possible equilibrium states might be. We’re talking about timescales on the order of tens of thousands of years. How are you able to run these kinds of models? In order to run some of these simulations of possible future scenarios, you need to simplify some of the processes involved. But we tried to do it in a way that included some of the most important feedbacks between the climate and the ice sheet. One important feedback we looked at was elevation-temperature feedback. As the top of the ice sheet melts, its elevation drops, and as it drops, the top of the ice sheet gets exposed to warmer air, and this causes it to melt faster, resulting in a positive feedback loop. A second important feedback we considered was the albedo feedback. As snow and ice on the ice sheet melt, the surface becomes darker. This allows it to absorb more radiation from the sun, which leads to more melting, leading to another positive feedback loop. Taking these two feedbacks into account is an improvement over simulations that have been done in the past. Once we’d done that, we came up with a parameter range that was considered valid based on comparison with observations of the present-day ice sheet and measurements of past changes, which allowed us to explore the stability of the Greenland Ice Sheet under warming temperatures. The range isn’t that much tighter than the previous simulation that was done, which was the one by Gregory and Huybrechts (2006) that was included in the IPCC’s 4th Assessment Report. In fact, theirs is the only other set of simulations that has been done to predict a stability threshold for the Greenland Ice Sheet. Their simulation came up with a range of 1.9°C to 5.1°C temperature increase above pre-industrial levels, with a most probable threshold of 3.1°C. They had about a 3°C temperature range within the 95% confidence interval (meaning there’s a 95% chance the temperature threshold lies within this range). Our simulation came up with a range of 0.8°C to 3.2°C above pre-industrial temperatures, with a most probable value of 1.6°C. Our range a little bit narrower, but still fairly wide. There’s still room for improvement. True. But it’s not so much that our model is more sensitive to climate than the Gregory and Huybrechts model. In our paper, we show that our model actually has a very similar sensitivity to the climate as their approach does. This means that capturing the feedbacks – which is what we’ve tried to do in our model – is very important. So the difference comes in how we determine where the threshold is. Gregory and Huybrechts used a somewhat indirect method. It wasn’t a coupled model. It didn’t take into account the elevation of the ice sheet as it changes over time. It only calculated the changing mass balance at the surface of the ice sheet. Their model said the threshold would be reached when the surface mass balance turned negative – meaning more ice being lost through melt than being gained through snow accumulating on top of the ice sheet. This is a theoretically valid way to look at it, but it’s not necessarily precise. If we use their method with our model, we get a very similar likely temperature threshold to theirs – something like 2.8°C. What makes our model different is that we used a coupled modelling approach – which included how the ice sheet would evolve under the changes at the surface I mentioned before. What we found with our model is that the temperature at which the ice sheet melts doesn’t correspond with the moment at which the ice sheet begins losing more mass than it gains at its surface. The ice sheet begins melting sooner than that due to the feedbacks. Which processes did you couple in your model? We have an ice sheet model, which is a 3-D fluid dynamics model. It uses an approximation called “shallow ice”, which is a standard model used for making long-term simulations. But it doesn’t include any short-term processes, like accelerated discharge from outlet glaciers, for example. However we did couple the model to a regional climate model to take into account regional changes in climate. The regional climate model is a fairly simple one. It doesn’t have the same kind of complexity a general circulation model (GCM) has. But we can reproduce the present-day climate very well. We can apply a temperature anomaly to this climate model, and the temperatures over the ice sheet and the precipitation falling on it change in a realistic way in response. Then we have a surface mass balance model to calculate how the surface mass balance of the ice sheet evolves. This evolution is then applied to the ice sheet model, which is allowed to evolve itself. As the surface elevation and surface albedo of the ice sheet change, this is then fed back into the climate model. As the ice sheet drops to lower elevations, the local air temperatures get warmer. The model can reproduce this process in a realistic way. Is a warming ocean accounted for in your model at all? We haven’t included the ocean in the model. However a lot of work is being done concerning how warmer ocean currents might accelerate melting of the outlet glaciers. But the ocean as a direct forcing mechanism on the ice sheet isn’t represented in any way in our approach. What about isostatic rebound of the Greenland landmass as the ice melts? We’ve included isostatic rebound of Greenland in our model. As the ice melts and the weight of the ice sheet is removed from the bedrock of Greenland, it will slowly be uplifted to an unweighted state. This uplift is also a very long time-scale process and is important for properly representing any potential new equilibrium state of Greenland. 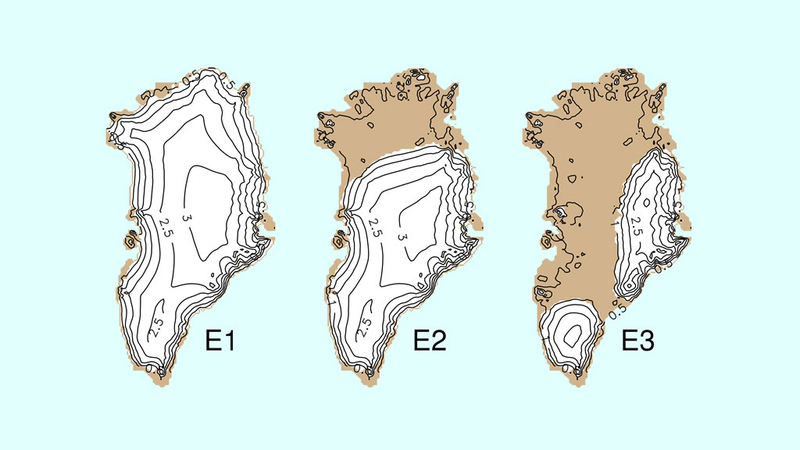 You propose a few future equilibrium states of the Greenland Ice Sheet in your study. Could you describe what these equilibrium states might look like and what kinds of conditions would be needed to reach them? The two main states we have in our model are either an ice-covered Greenland like we have today, or a mostly ice-free Greenland, with some ice in the highly elevated mountainous areas. If it gets warm enough for a long enough period of time, it gives the ice sheet a chance to melt, and the ice will disappear completely. Another possible scenario is that if things warm up for a period of time – for a few hundred years, let’s say – and we lose some of the ice sheet in certain regions – and if somehow we’re able to cool global temperatures again to below the threshold at which the ice sheet would continue to melt – then it would be possible for the ice sheet to enter into a new equilibrium state. But the ice sheet would be smaller than it is today, and it could only happen if it melts form a present-day fully ice-covered state, then temperatures cool a bit and the ice sheet is allowed to find a new equilibrium. If it got cold enough, the ice sheet could even re-grow completely as snow accumulated and formed layers of ice. But the timescale of that kind of scenario would need to be very long. However with a strong temperature forcing, it’s unlikely that the Greenland Ice Sheet would be able to reach any intermediate stage. The ice sheet would essentially be on a path towards an ice-free state. If you reach a point where all the ice covering Greenland has melted, and then the temperature drops, it won’t be possible to reach a new equilibrium state in between. So this means above the 1.6°C temperature threshold, your model predicts a complete disappearance of the ice eventually - barring some cooling mechanism coming into play? Yes, or some change in the temperature anomaly itself. But with the high temperature anomalies that we expect in the coming centuries, there’s no mechanism I can think of that would allow the ice sheet to stabilize at some intermediate point. We would have to wait for the Earth to eventually cool again naturally (over thousands of years) as it moved towards a new ice age. Alexander Robinson is a post-doctoral researcher in the Paleo Modeling and Analysis (PalMA) group at the Universidad Complutense de Madrid in the Department of Astrophysics and Atmospheric Science.